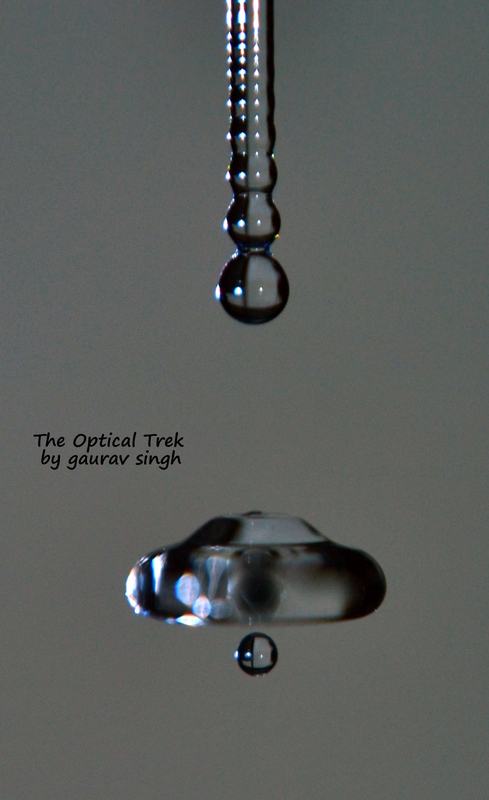 Brief write-up: Water drop formation takes place due to competing gravity and surface tension forces. When the gravity force exceeds the attaching surface tension force, the liquid is pulled in the form of long thread, ultimately leading to necking and breakup[click me] . Gravitational force becomes significant only in case of large drops and becomes insignificant for very small(order) drops [Ref: Atomization and Sprays by Arthur H. Lefebvre]. Different kind of structures are formed during breakup. One of the well-known drop structure formed is ‘satellite drops’. Satellite drops are formed by the break up of the ligament that connects two capillary drops (or one capillary drop to the jet). They are called satellite drops since they look like smaller satellites near the bigger drops that form from capillary instability. The application of formation of satellite drops is exclusively found in charged ink jets (printers), wherein continuous jet breaks into bigger drops and later into further smaller satellite drops. The experiment which I did, was mainly intended to see different structures formed during free fall capillary water jet break-up. Later I read more on the physics part, where in I found the satellite drop formation and its application. The size of satellite drops is much(an order) smaller than the drops formed by capillary instability from the jet. I think the small drops in picture[ 9th image and 11th image ] seems to be the only satellite drops. Pictures at the last of this page are cropped images and show different stages and various types of drop structure formed during break-up. Gaurav, its really great. Now i am taking a course on atomization and sprays. Indeed your photography is really inspiring to learn more into the stability analysis! Thanks a lot. Thanks Vishnu…! Are you doing Atomization and Sprays under Mahesh Sir? Did he show some of my pics in class? Yes. amazing the shape of the drops. Fascinates me to.